The elevated role of medical research on the U.S. national policy agenda offers unprecedented opportunity for patient engagement and reflects an increased demand for patient input, say FasterCures leaders in an article published today in the journal Science Translational Medicine. 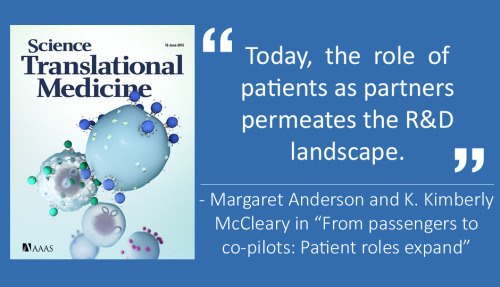 The article, “From Passengers to Co-pilots: Patient Roles Expand,” by FasterCures’ Executive Director Margaret Anderson and Managing Director K. Kimberly McCleary, documents the progression of patients over the last century from passive recipients of medical care to active partners in defining and prioritizing research strategy for their diseases. The authors begin by outlining the history of patient engagement in medical research and development, from the formation of the March of Dimes in the 1930s, to the tremendous social and public policy advancements spurred by the HIV/AIDS movement in the 1980s, to the proliferation of the venture philanthropy model in the 2000s. Anderson and McCleary then dive into the “perfect storm” of federal policy initiatives that have recently jump-started activities to more formally elicit and include patient perspectives along the full range of clinical development. They point to the 21st Century Cures legislation in the U.S. House of Representatives, the Precision Medicine Initiative announced by President Obama in January, the Patient-Focused Drug Development Initiative of the U.S. Food and Drug Administration, and many other advances as demonstrative of the unprecedented opportunity for patients to more meaningfully influence medical product decision-making. There is a need to expand the capacity of all participants-industry, academia, government and patient organizations-to engage patients in biomedical research, medical product development, regulatory decision-making and healthcare delivery. Developing appropriate, scalable, sustainable methods and practices will require collaboration, experimentation, coordination and transparency. It’s too early to tout emerging practices as being “best,” and standards are likely to change rapidly. Different diseases, disease communities, stages of disease and stages of life might warrant distinct approaches to patient engagement and integration of patient input. Patients are found not only in conventional settings, such as disease-specific foundations and clinics, but are also living their lives as members of social media networks and local community organizations. As a companion to the Science Translational Medicine article, FasterCures also released a video, “Advancing the Science of Patient Input,” that highlights the history of patient engagement and FasterCures’ work in this area.